Product Description: This volume of Legendary Muscle Cars is powered by Ford, and loaded with fun and excitement. Dennis Gage, a real Ford guy, brings you many of the greatest Fords to ever come out of Dearborn-and some awesome Shelbys too-including the Mustang, Torino, Cobra, and GT 40. 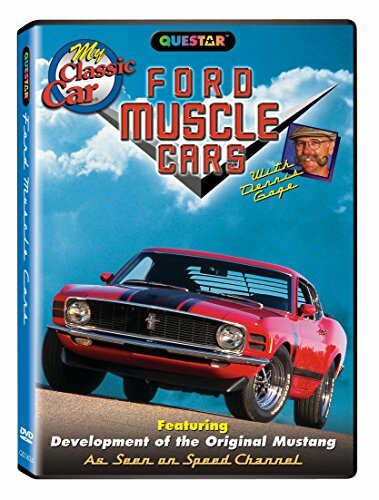 Tail-to-tip tours of classic Ford Muscle Cars, and interviews with Ford legends, collectors and restorers, along with some priceless archive footage, make this DVD a dream come true for Big Blue fans! The following classic Fords are focused on: 1965 Mustang GT Convertible Hi-Po; 1968 Mercury Cougar GT-E; 1969 Boss 429 Mustang 1970 Mach 1 Mustang; 1970 Torino 429 Cobra Jet; 1970 Torino King Cobra; 1971 Boss 351 Mustang. Extra Features: Ford Legends - 427 Competition Cobra; Shelby Daytona Coupe; Shelby Super Snake Mustang; GT 40; Development of the Original Mustang; Carroll Shelby Part I; Carroll Shelby Part II; Pete Brock. Ford Car Shows - Ford 100th Anniversary; Mustang 40th Anniversary; 29th Shelby American Auto Club.